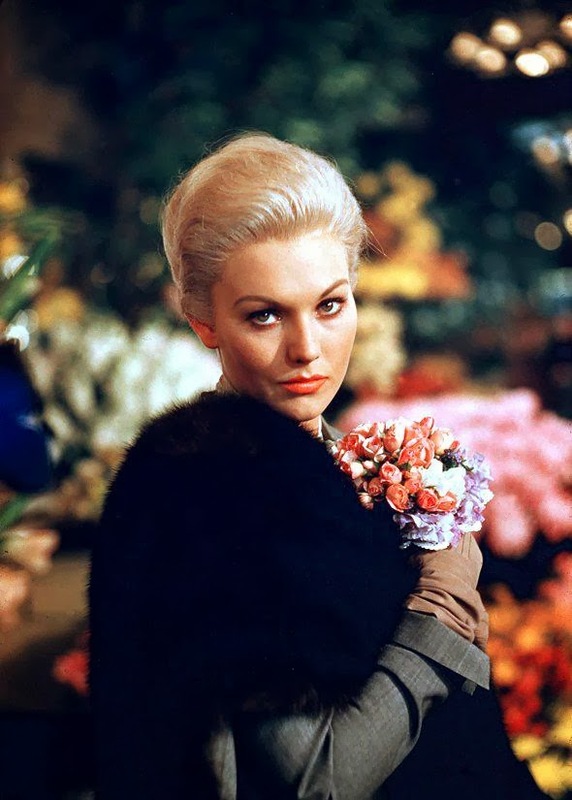 In Hitchcock’s Vertigo, Scottie Ferguson is performed as a quintessentially Freudian Male, with deeply narcissistic impulses pervading his relationship with the 2(3) women in the film he maintains relationships with. Though as Mulvey points out, his narcissistic voyeurism creates a perfect opportunity for both the scopophilic pleasure and the narcissistic impulse of the cinematic audience. For both Scottie and for the audience he carries with him, Madeleine/Judy is the object that brings that scopophilic pleasure in looking. While Scottie’s rather pathological infatuation with Madeleine is treated sympathetically as par for the course, (after all, he’s given the task of spying on Madeleine and Linda Williams explains that, in cinema, too look is too desire.) But the desires of the women in the film (Midge, Madeleine / Judy) are all punished in the course of the film. While their desires are not treated as inexplicable (they are, after all, falling in love with the normative heterosexual hero/optimized alter-ego of the viewer) they are not treated as justified in their desire in any instance. Whereas Scottie’s only potential turpitude, pursuing a married woman, is blotted out by the revelation that he’d really been interacting with Judy, pretending to be Madeleine. 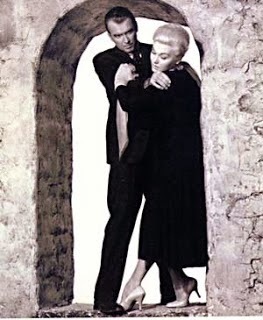 In his desire, and his three-dimensional action as he pursued Madeleine-then-Judy and then manipulated her as an object-to-be-viewed for his pleasure, all the narrative devices seem to sympathize with him. Only an analysis removed from the language of the screen might find him rather guilty of Judy’s accidental death. By contrast, Midge is punished for her unreciprocated desire by continual dehumanizing rejection, especially after her satirical self-portrait is poorly received, and ultimately by Scottie refusing to recognize her or return her gaze during his hospital stay. Scottie clearly views her as a mother figure (even calling her mother), and treats her advances as Oedipal. Theoretically Judy as Madeleine is punished for desiring Scottie by being separated from him after the murder of the real Madeleine is completed. While Judy’s death at the end of the film is also a narrative punishment for her complicity in Madeleine’s murder, it is also more effectively a punishment for her desire for Scottie, and for the wrenches she threw in his scopophilic enjoyment by allowing him to “fall in love” with a non-entity. That non-entity is telling. At the end of the film we still know next to nothing about Madeleine Elster or Judy Barton, both dead. We are acquainted only with how their deaths have impacted Scottie. As Mulvey quoted Budd Boetticher, “What counts is what the heroine provokes, or rather what she represents. She is the one, or rather the love or fear she inspires in the hero or else the concern he feels for her, who makes him act the way he does. In herself the woman has not the slightest importance.” Any further backstory or explanation of Judy Barton’s relationship or interactions with Gavin Elster might have made her more of a three-dimensional character, but in this narrative she functioned purely as an object for exhibitionist pleasure, so such character development was foregone. In a way, Scottie is excused for having fallen in love with a murderer, because as she was pretending to be Madeleine, and portraying a person given to fits of possession or insanity, that insanity had the same effect that “blindness” had on the silent-film heroines discussed by Williams. Her trance-like state portrayed the same lack of autonomy and desire that Williams correlated to literal or figurative blindness in virginal heroines. The Madeleine/ Judy character doesn’t even speak until almost 40 minutes into the film. She is simply viewed, and is certainly on display (on about 6 levels). With her bleached blonde hair and her white coat, she oscillates between appearing virginal and ghostly. Judy’s guilt narratively justifies Scotties’ rather bizarre behavior. Mulvey explained that “The power to subject another person to the will sadistically or to the gaze voyeuristically is turned onto the woman as the object of both. Power is backed by a certainty of legal right and the established guilt of the woman.” Thus her role as a murder-accomplice becomes symbolic of the threat of castration. The guilt or shame universal to women. “The male unconscious has two avenues of escape from this castration anxiety: preoccupation with the re-enactment of the original trauma (investigating the woman, demystifying her mystery), counterbalanced by the devaluation, punishment, or saving of the guilty object.” Mulvey here describes every motivation of Scottie’s character in the second half of the film. As he finds Judy, then literally forces her to re-enact the death of Madeleine. He also punishes her as a guilty object, both through the process of grooming her to re-perform her role as Madeleine, and then by making her re-enact Madeleine’s death with him by going to the top of the tower, and ultimately by placing her where she would re-enact Madeleine’s death with her own death. Judy is even seen to be participating in her exhibitionism (both as Madeleine and as Judy) willingly, with the motivation of desire for Scottie. Once she actively pursues this desire, telling Scottie she’ll conform to all the changes he demands if he’ll “just like me.” Then Scottie’s masochism kicks into high gear. 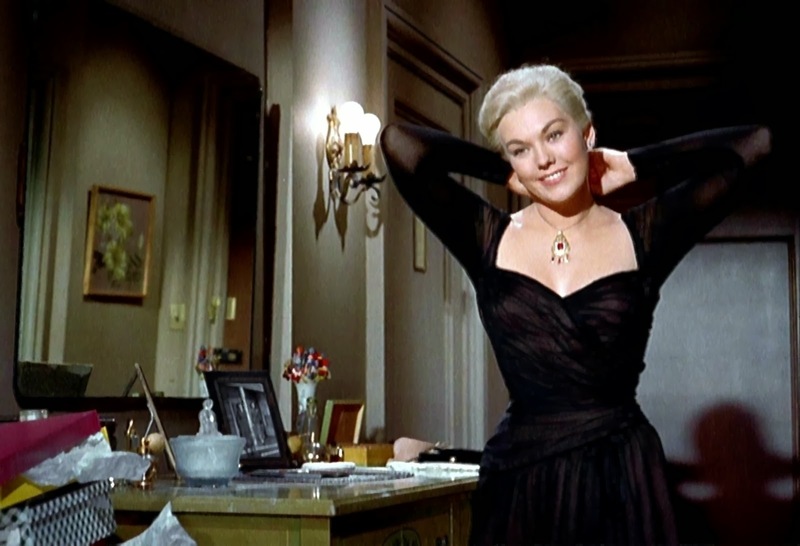 That this scene coincides with the necklace clue that allows Scottie to solve Judy’s mystery, and punish her for it, suggests that perhaps Judy was being punished for desiring Scottie, and for having foiled his sadistic infatuation by having attracted him under false pretenses and having rendered the already threatening female object too threatening by making it a deceit. Laura, Mulvey. "Visual Pleasure and Narrative Cinema." The Norton Anthology of Theory and Criticism. New York: W.W. Norton &, 2010. N. pag. Print. Williams, Linda. "When the Woman Looks." The Dread of Difference: Gender and the Horror Film. Austin: University of Texas, 1996. 15-34. Print.